X Wing Pilot – A pilot, sometimes called a flyboy, directly controlled the operation of a vehicle while located within the same craft. 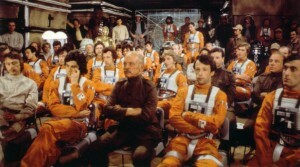 A pilot was often assisted by a copilot, navigator, astromech droid, weapons officer, or other crew members. The term “pilot” was applied across vehicles used on land or in water, air, and/or space. The military designation for a pilot was PL-1. Whether this applied to all pilots or only starfighter pilots is unknown. On smaller ships, the word pilot and captain were interchangeable, but on larger vessels, the pilots were rarely the commanders of the vessels. No visible zippers or snaps. Raised buttons (acrylic preferred) with acceptable colour schemes.